This wonderful recipe is like a quiche, but stretched out in a jelly roll pan. The combination of textures and flavors in this dish is delicious. Use my recipe for Hot Water Pastry for the pie crust for best results. You can use two purchased pie crusts instead, or some refrigerated crescent roll dough, but the results won't be as good. You could use other types of cheese in this recipe if you'd like. Swiss or Monterey Jack cheese would be good choices. This wonderful recipe is perfect served with a green salad tossed with sliced avocados and cherry or grape tomatoes and a simple vinaigrette salad dressing. Add some iced tea or a glass of white wine for a great meal. You don't need anything else with this recipe because it's just perfect. Preheat the oven to 400°F. Line a 15x10" jelly roll pan with the pie crust, including up the sides. Press down firmly, making sure there are no holes in the crust that the filling could leak through. Place the crust in the refrigerator while you are preparing the filling. Make sure you use a sturdy pan. If you use a light weight pan it may warp in the oven heat. For the filling, brown the ground beef, onion and garlic in a heavy skillet over medium heat, stirring to break up the meat. This should take about 10 to 12 minutes. Drain off any excess fat. In a medium bowl, beat together the flour, salt, pepper, eggs, evaporated milk, whole milk, and dill weed until smooth and combined. Sprinkle the ground beef mixture evenly into the crust. Sprinkle evenly with the Cheddar cheese. 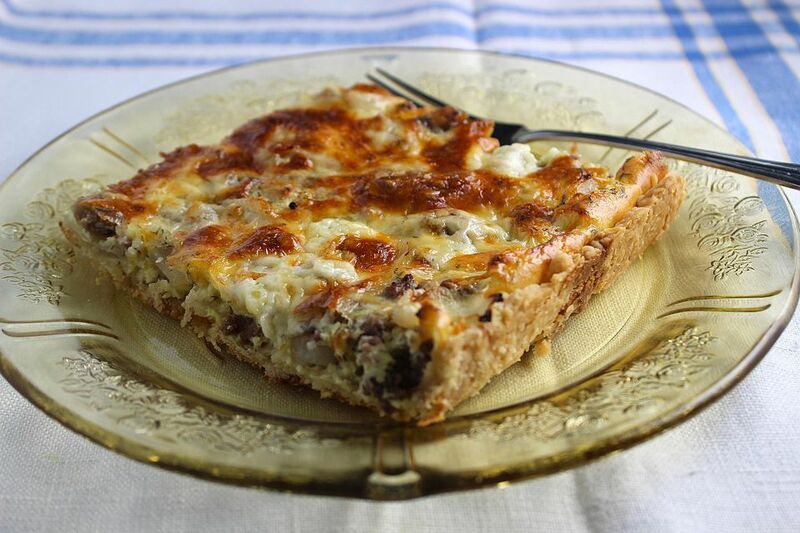 Make sure the crust is evenly covered with the beef mixture and the grated cheese. Then carefully and slowly pour the egg mixture over the cheese and the ground beef mixture so it fills the pan. Sprinkle everything with the grated Parmesan cheese. Bake the pan quiche for 25 to 35 minutes, or until the filling is puffed and beginning to brown. Cut into squares to serve.